While in the US, I am interested how social media is used to promote justice and peace by the UCC Justice and Witness Ministries. I was happy to talk to their online communications specialist Jessie Palatucci who is in charge of the ministries’ online communication. Of course, they do Facebook, Twitter and Flickr. The Justice and Peace Action Network sends out email newsletters regularly. Now peace in Syria is a pressing issue. Facebook and Twitter are updated several times a time to inform about the latest developments and petitions. It is, however, not only information but also a enabling people to share their concerns easily. 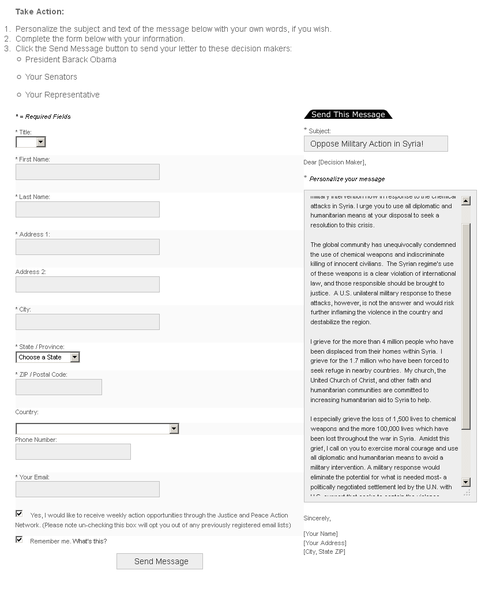 Their form-to-mail tool makes it really easy to send a personalized online petition to politicians, just click on the link on the tweet and fill in the empty fields and click submit. It is that easy.